Branding is NOT just a company logo. Branding is NOT just colors and typography. It is NOT only a face of the company or a mascot. However, it is a collective effort in communicating what your company stands for into every element that your consumers hear, feel, see, etc. This includes the design, messaging aspect, a brand story that your customers can resonate with, your business name, products, initiatives and reputation. When building your brands’ reputation, you must be consistent with what you are delivering to your customers. Your target audience has to be able to experience a uniformed look and feel. For example, if you’re looking to market your goods and services to prospective motivated sellers, perhaps creating a letter outside of the normal “Yellow Letter” may present a rather different consumer experience. With branding, ideas and results are ongoing, thus having a strong brand is vital for your real estate investment company. For one, branding improves recognition. A strong brand creates trust, which in turn generates new customers. As small business owners, we must understand how every effort developed through branding has a desired result. And something to note is that creating a relevant brand aids your business’ advertising efforts. 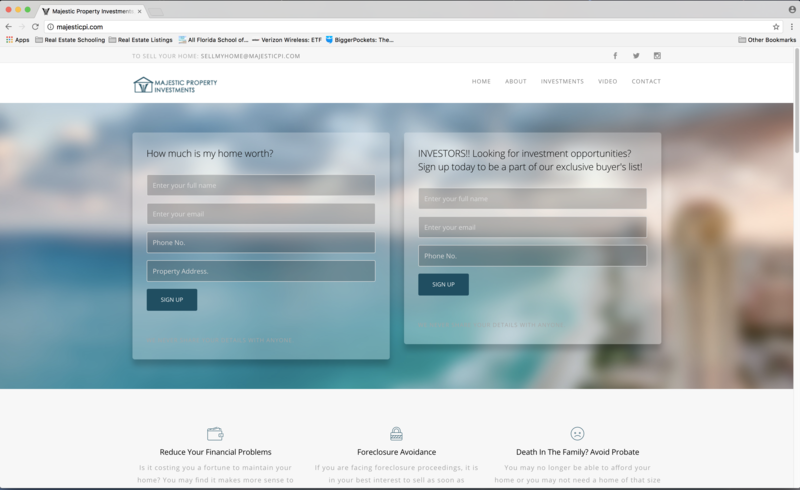 So the question you may be thinking to ask is how do you build a brand for your real estate investment company. Well, regardless how small (1-2 person operations) or large (100+ person operations), these branding principles will help your company make its mark in a very competitive industry. Here are 5 steps to creating your real estate investment brand. Real Estate Investment is a multi-faceted industry. When researching your target audience, it is imperative that you understand why and what you are choosing to communicate your brand to a particular crowd. Researching will not only allow you to gain a better understanding of your target audience, it will also provide great insight about your competitors. Now as for researching your competition, you must understand your value proposition (what makes your brand better) and how do you greatly differ from your competitors. This will later help you immensely when designing your marketing and branding initiatives. Because of the complexities in real estate investing, when you are deciding how to build your brand, you must hone in on one or two specialties to showcase your expertise. For example, one can decide to focus on purchasing discounted properties through a method known as wholesaling. Others may decide to purchase discounted properties through local sheriff sales or auctions. There are real estate investment firms that aim solely on buy and holds, while others seek to pursue fix-and-flips. Keep in mind that as a result of correlating your brand to the areas you decide you focus on, you will inevitably be seen as an expert in your field. Once you have researched your target audience, competitors, and industry, and have decided the specialities to focus on, next is to choose a business name that best matches your research and personal desires. When selecting a business name, be sure to determine whether or not the name is legally registered. Begin by doing a local search, then broadening your search with TESS if you wish to have your business’ name trademarked. Upon securing a business name, registering it with your local county court office or federally trademarking it, you can begin brainstorming to decide what catch phrase or slogan to associate with your brand and industry. It is suggested that a hook should have no more than 5 words. Anything above 5 words may begin to lose its effectiveness. Gather your team, perhaps some friends and family, collect words that are linked with your brand, real estate, and investing and get creative. Now that you have completed your research, selected the specialities to center on and created a brand name, it is now time to plug in your brands’ story to the mix. Your brand story must exude the facts about your business and the feelings you would like to create to inspire your consumers. It is the what you do and why do you do it. In doing so, it is important that your company’s mission is also communicated. When designing your logo, be sure to tie in relevant concepts that relate your brand story to that in real estate. Think about Amazon.com‘s logo. Its initial concept was an online book store. And as the years have gone by, Amazon became one of the largest online retailers today. Over the years, Amazon has innovated its brand story and logo altogether.If you take a look at Amazon’s logo it is symbolic in that the online retailer sells everything from A to Z. When creating your logo be certain to connect your brand story with the design. In real estate investing, this may show that your company is very transparent in communicating the process of your deals. It may exhibit that your organization closes on deals in ample time. If it is in your budget, please considering including a graphic designer. If it’s not, lay out a sketch pad, research some examples of logo designs and sketch away. It’s is now a wholistic package! You’ve done research, selected areas to focus on, chosen your business name and slogan, and created an appeal for your brand. It is now time to apply all elements to your communication channels. Be sure to keep in mind that social media should also be included on all of your branding strategies. From display images to business page banners, copy, email newsletters, etc., you must remain consistent with your company’s design components, your mission, and your brand’s messaging to the customers you wish to serve. All in all, once all of your building blocks are working in a seamless manner, you must then establish a method to monitor the results; hence, analytics… At a later post, I will explain how to establish analytics for your real estate investment company. Until then, I hope that I was able to provide you some value!